Today I wanted to share a card I made with the new Sealed with Love Bundle. This bundle is available in the 2017 Occasion catalog & is available through 5/31/2017. 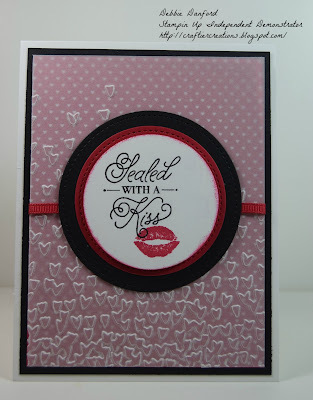 I used the new Falling Petals Embossing folder with vellum, & layered it onto of a piece from the Sending Love DSP. Die Cut the circles & a little stamping & your done. I cut the vellum the same size as the DSP, & to attach it I just put adhesive under the spot where the circle is.